Don't miss the following webinar coming this Thursday from Boris FX and Imagineer Systems. As always there are some fantastic prizes to be won as well! 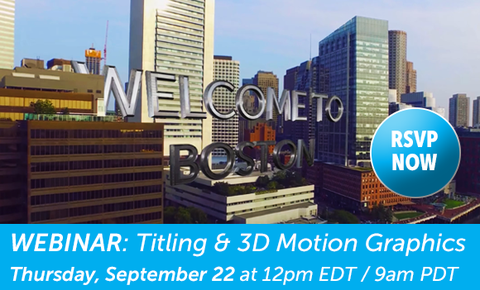 Producer, editor and VFX artist Vin Morreale will demonstrate how to utilise the BCC 3D Objects category of Continuum Complete 10 to create unlimited titling and 3D motion graphics options, with a special focus on the new BCC Title Studio. The webinar will last one hour, remember to sign up here to reserve your spot!